It is fairly common among divers that, once the initial excitement of diving wears off, they tend to focus only on “highlight species”, be it Big Stuff or macro, and miss out on the amazing variety that is on offer in front of them on virtually every dive. Most people don’t realize this, but on any single dive, you can see more species of life than you would if you spent a week in one of the top wildlife reserves of the world. Nature enthusiasts – be it safari-goers or birders – know that you appreciate a lot more about wildlife once you are able to understand what you are seeing and what to look for: behavior, variety, ecology. All of these transform a passive viewing experience into one of discovery, where gems on insight can be found anywhere and at any time. One of the most common feedback items we have gotten from our divers is a desire to learn more about marine life than just names and signs of the top 10 most popular fish. And while there are training programs out there, these tend to be fairly general and not in-depth enough. So we have developed our own naturalist program, designed and refined over the course of 8 months by our in-house marine biologist, Chetana Purushotham. The objective of the program is to teach you more about the incredible underwater world – how it works, what the various inter-dependencies are, how to identify various fish families and how to critically evaluate a reef ecosystem. In short – to take you from being a passive spectator to a trained observer, and you can apply this anywhere in the world you go diving. At the end of it, you will become more aware of the amazing variety that lurks on every coral head or every rock, and will hopefully learn to appreciate all the wonders of the reef – and not just the sharks or mantas. This is a fieldwork-intensive program, and will consist of 4 dives, including a night dive. There are also discussion sessions and briefings, which provide a framework for the program and each topic above. Option 2: A bolt-on program which can be added on to any existing dive package for certified divers (ie, so excludes the Learn to Dive program). Here, 2 of the day dives and the night dive in your package would be applied towards this program, and you would do an afternoon dive extra. 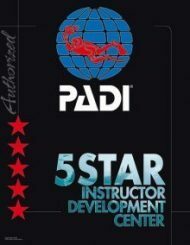 So you pay extra only for the instructor time and the 1 additional dive. Option 3: A bolt-on program which can be added on to the Learn to Dive package – here, the 2 additional dives included in the package would apply towards this program, and you would add a day dive and a night dive to your package. So you pay extra for the instructor time and the night dive + afternoon dive.